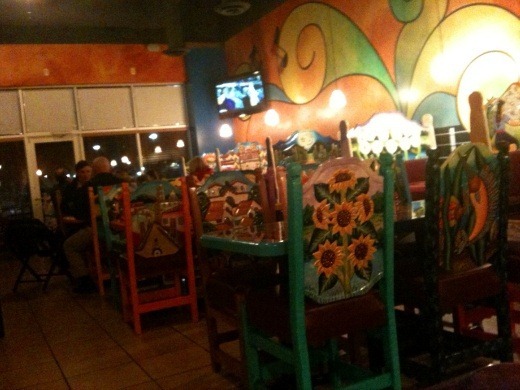 …but it was actually pretty cute inside. We were first served complimentary chips and salsa. The chips were simply average (thin, not especially crisp, lacking salt), but I was a bigger fan of the salsa. 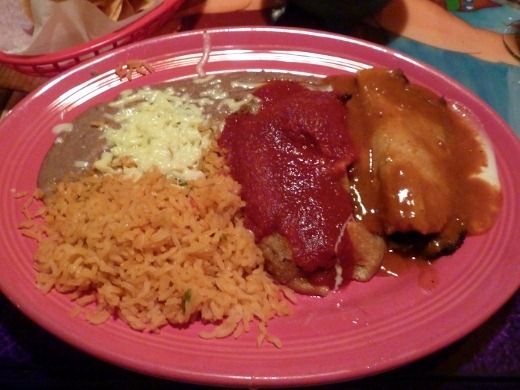 It was more of a thick puree, which is what I like in a salsa. While I do enjoy a chunky salsa, it’s only good if it is thick AND chunky. Big chunks in watery sauce = not good. This salsa, however, was not chunky, but it was a consistent, thick texture, and it tasted good too. 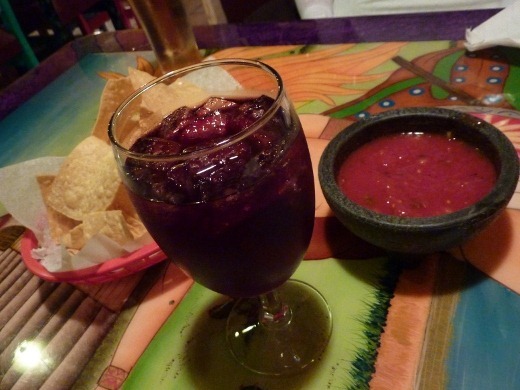 I had a glass of sangria with dinner but it was clearly not homemade – definitely a pre-made sangria. It was just so-so, but it was cheap, so whatevs. After that GIANT Mexican meal, today at work we were treated to lunch, and I had a big, yet unpictured, Legumbre Burrito from Bandito’s, filled with beans, salsa, guacamole, sour cream and cheese. It was alright but didn’t knock my socks off. 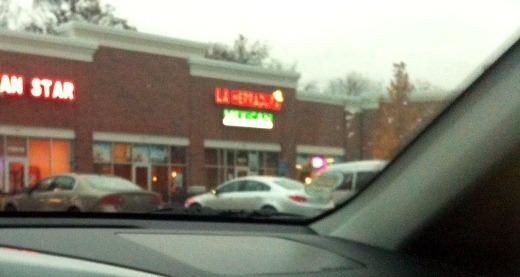 La Herradura’s food was more impressive, at least based on my first impressions of both restaurants. It’s always fun to try a new place, though. 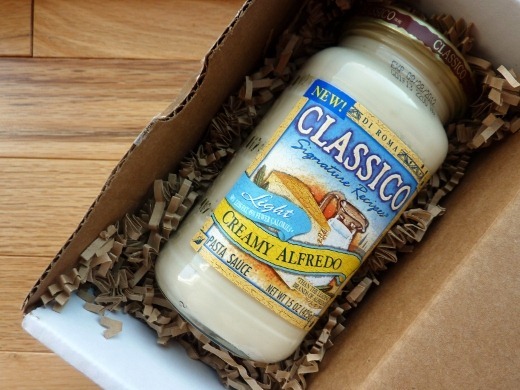 As part of the Foodbuzz Tastemaker Program, I received a free jar of Classico Light Creamy Alfredo Pasta Sauce. Honestly it’s been a while since I’ve used store-bought alfredo sauce. Typically it’s quite laden in calories and doesn’t really fit into my Calorie Counting lifestyle. Back in college, however, one of my more frequent easy meals was simply cooked pasta topped with either jarred alfredo sauce or prepared pesto, accompanied by frozen garlic bread. (Hello calories!!!). 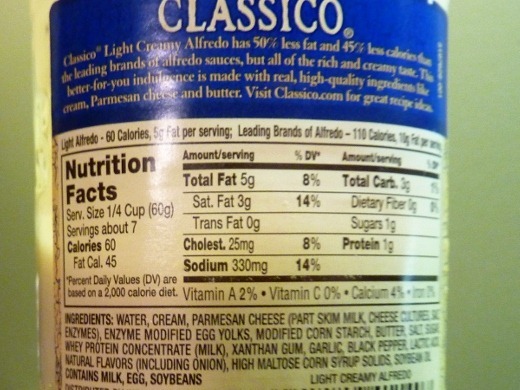 So I actually was kind of psyched by the prospect of lower-calorie alfredo sauce. Also a tad skeptical. This light alfredo has only 60 calories per 1/4 cup serving, versus 110 calories per serving in a typical, non-light alfredo sauce. The ingredients weren’t too crazy either. I’m happy to say that I actually came up with my own recipe for this sauce. As you’ve probably noticed, I cook…a lot. And try lots of new recipes, every week. But it’s infrequent that I actually come up with my own dish. So here you go – a MegGoesNomNom’s Original Recipe. Plus, it only takes 5 main ingredients. Claire Robinson would be proud. Not including a few freebie items from the pantry. 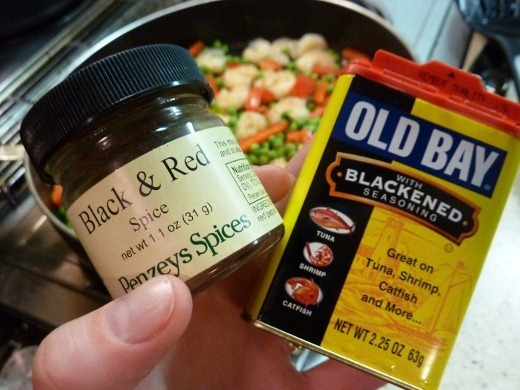 Old Bay Seasoning – good on everything! Love it on veggies like corn on the cob and potatoes, kale chips, seafood, chicken, etc. And guess what!? It was GOOD! Like…really good! Not just my dish, but the sauce too. Not gonna lie, I swiped my finger tip along the lip of the jar to taste the sauce and guess what!? It did not taste light at all. Classico: I’m impressed, I gotta say. Typically my calorie counting philosophy is to enjoy everything in moderation. To allow myself to enjoy the indulgent items I crave, but again, in moderation. I don’t always necessarily like to skimp out and buy the “light” or “reduced fat” versions of items because it’s often more satisfying to enjoy a smaller portion of the “real deal,” however, I couldn’t even tell this was the light version. Disclaimer: This is my honest opinion, I’m not being paid for a good review. 2. Heat EVOO in skillet, over medium-high heat. Add shrimp, and sauté. It only takes a few minutes to cook. Once it turns opaque, it’s done! 3. 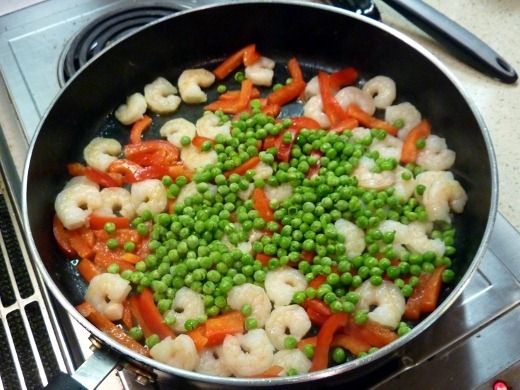 When shrimp is just shy of being cooked through, add sliced red bell pepper, and sauté until crisp-tender. Season shrimp and veggies to taste. I added lots of Black & Red Spice (which again, contains black pepper and cayenne pepper) for heat, as well as Old Bay seasoning, salt and pepper. 4. 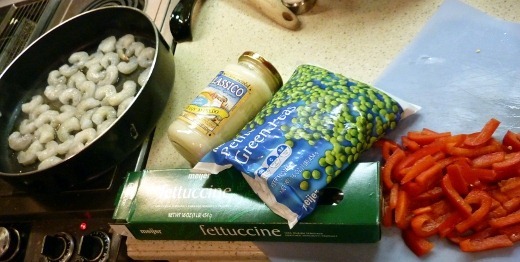 Add thawed peas and cooked pasta. Let the dish heat through for a minute or so. 5. 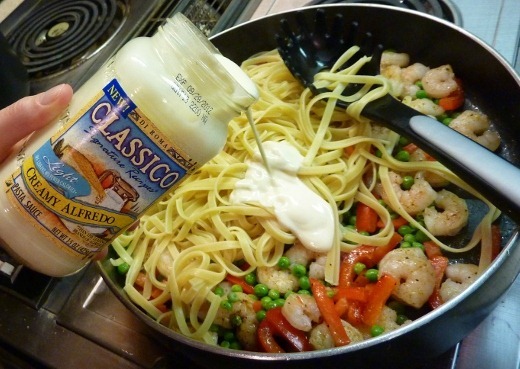 Add Classico Light Creamy Alfredo Pasta Sauce and stir to combine. Enjoy! Well, you’re in luck. I have two daily anecdotes for you, dear reader. 1. A few minutes ago I sent this text to the huz, “If you want to get them on the way home tomorrow it’s okay. But you gotta discard corpse tonight.” Uh….what!? Well, this evening I had the unfortunate displeasure of discovering a dead mouse body in my basement. Hooray. So “them” = mousetraps. “Corpse” = well, you can figure that out. 2. My big toe joint (that’s some scientific anatomy terminology right there) is JACKED up. Here’s a tip, dear reader: if you are crazy like me and jump around your loft to do OnDemand Exercise TV videos, do yourself a favor and throw some tennis shoes on your feet. Doing barefoot jumping lunges is just a bad idea. BAD IDEA. Trust me. Currently listening to: Shake It Out – Florence + The Machine. I’ve been rocking out to the that song on repeat for the last week or so! It’s so good! It’s completely stuck in my head today! 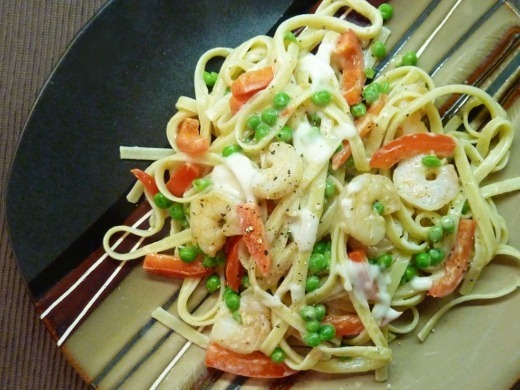 I actually haven’t ever made homemade alfredo before – I bet it is amazing! I just read the article in the Saveur link and the picture of the buttery creamy pasta is making me swoon!